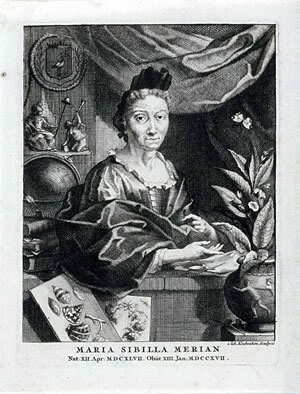 Maria Sibylla Merian was an early female naturalist who is considered a groundbreaker in both botany and zoology. Born in Frankfurt in 1647, in her early twenties, Merian moved to Nuremberg, Germany. In 1670, she published her first book—a catalog of European, moths, butterflies and other insects. The book featured illustrations by Merian. For the catalog, she collected, raised and observed living insects, which was a departure from the standard practice of utilizing preserved specimens. In 1685, Merian left Nuremberg and moved with her daughters to the Dutch province of West Friesland. In 1699, Merian, now 52 years old, and her youngest daughter traveled to the Dutch colony of Suriname, in South America. Earlier, Merian had seen some of specimens of flora and fauna from the colony and wished to study them in their natural habitats. She spent the next two years in Suriname. In 1705, based upon her experiences in Suriname, Maria Sibylla Merian published her best known work, Metamorphosis insectorum Surinamensium, (or, Insects of Suriname), with Merian’s elaborate and colorful illustrations. Additionally, Merian was a prolific botanical artist, producing collections of drawings in 1675, 1677, and 1680. Separately and most famously, she created illustrations of insects and their processes of metamorphosis. 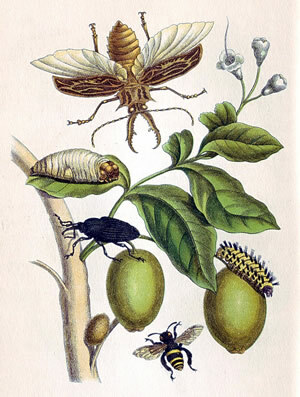 Merian wrote and illustrated the life cycles of 186 insects. While a handful of scientists were aware of these processes, her work is considered the first time this concept had been considered comprehensively. The resultant work that Maria Sibylla Merian published, Der Raupen wunderbare Verwandlung und sonderbare Blumennahrung (or, The Caterpillars' Marvelous Transformation and Strange Floral Food) was very popular in European society as it was written in commonly used languages, instead of the traditional use of Latin. Merian's flora and fauna drawings are highly collectible and prized by scientists and laymen around the world to this day. Shortly before Maria Sibylla Merian's death in 1717, her work was seen in Amsterdam by the Russian Czar Peter the Great. After her death, Peter the Great acquired many of Merian’s paintings and illustrations which are still housed in academic collections in St. Petersburg. 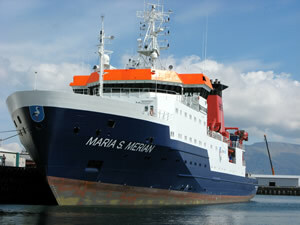 In 2005, in recognition of her groundbreaking scientific accomplishments, Germany financed the construction of the RV Maria S. Merian, the nation’s most sophisticated and well-equipped oceangoing research vessel. - Merian: Merian as depicted on a 500 Deutschemark bill.